American consumers are asking for more American-made products, and businesses are listening, according to a new report from Grace College Online. After reportedly losing 2.3 million manufacturing jobs between December 2007 and February 2010, the sector has rebounded as more companies bring operations back to the country. 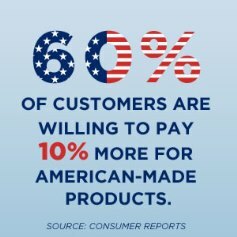 And nearly half of Americans have made a special effort to buy products made here. Although marketing may not be the primary motivation for companies to manufacture products in the United States, the fact that Americans love the “Made in America” label is compelling. It offers companies selling power. According to Consumer Reports, nearly eight in 10 Americans would rather buy an American-made product than an imported one. More than 60 percent of customers are even willing to pay a 10 percent premium for domestic products. A Gallup Poll found that 45 percent of Americans made a special effort to purchase products made in the country. In the Gallup Poll, the leading reason for buying American products was to support the country and for patriotic motives (32 percent). Keeping and creating jobs in the country (31 percent) was second, followed by motivations of it being good for the U.S. economy (20 percent). Thirteen percent purchase American-made products for superior quality. “Patriotism and the pursuit of positive corporate images as standing behind the U.S. economy” are a part of what’s driving companies to bring manufacturing to America, MarketWatch reports. By producing domestically, companies gain customer support. This entry was posted in Business News and tagged american, grace college, grace college online, made in the usa by Matt L. Ottinger. Bookmark the permalink.